I’m not even going to try to be intellectual with this post, (yeah right, lol) I’m just going to share my Miss Universe kick with you. You must have read about Steve Harvey’s mistake of announcing Miss Columbia as Miss Universe, instead of Miss Philippines. I can barely imagine the trauma Miss Columbia is having at the moment, and I only pray she rises above it soon and even shines as a result of it. However, my dear friend, did you notice Miss Bulgaria? She came out straight to tell Miss Philippines to get her pretty self over there to take her crown! I saw the picture above with the caption and simply had to write about it. It is not normal for a beauty queen in her own right to do what Miss Bulgaria did, and I need to break this down to you. You see, beauty queens are supposed to be composed and untouchable in their glowing ethereal beauty, irrespective of the situation. You are not supposed to think about Agbani Darego, the first black Miss World and imagine her licking her fingers after demolishing a well prepared plate of pounded yam and egusi soup. No way! Agbani can only be imagined sitting in a corner, wearing Dolce and Gabbana (don’t dull). Yes, beauty queens portray an image of unattainable beauty (a story for another day) but that is the image they have been programmed to portray, and to have Miss Bulgaria break that stereotype in order to encourage another queen is really refreshing and inspiring. Wachu say? You don’t say. It was obvious that Miss Philippines heard her country being called, but she just didn’t know what to do. We all have, or will have moments like this in our lives, when we have to make key decisions, take a chance, or grab a rare opportunity. There will be moments when after surveying the competition, you will doubt whether you are truly qualified for that job, or you may wonder if you deserve such an amazing relationship, considering your past relationship history, and it is at this point that you need a Miss Bulgaria to tell you to go on and do it. Go on and own it. Go on because you are worth it! Today, I am your Miss Bulgaria, telling you to seize the opportunity, apply for that internship, send that guy or girl a direct message (please don’t clog my inbox, lol). You need positive people who will go out of their way and break all stereotypes to reinforce you and tell you that you are worthy, and if you already have some people like this in your life, I suggest you keep them close. Unfortunately, sometimes, you may not have anyone to cheer you on and this is why it is important to build your own capacity to believe in yourself, and to genuinely believe that you are enough. It is not easy to believe in yourself sometimes though, particularly when you are up against stiff competition, but how can you convince others of your awesomeness when you haven’t convinced yourself of it yet. You see, I was having this conversation a while back with someone, who stated that I always seemed sure of myself. I was taken aback for a second, because truly I hardly ever feel sure of myself. I am a work in progress, and I vividly recognize this, but I also try to recognize that I am a good work in progress.This usually involves me mentally telling myself that “Mariam you are awesome,” or me praising myself for my successes, or calling my personal Miss Bulgaria whenever I cannot find it within me to remember my awesomeness. If you are set to do great things, please find some Miss Bulgarias to cheer you along on the way, but don’t forget to also try to find the Miss Bulgaria that is hidden right there inside of you. If you have tips on how you encourage yourself before you take a big step, please share with the house. P.S. I love beauty pageants. A part of me feels I am not supposed to love them because most of them depict women as… we know the arguments. Yet I still really really like watching them so you can sue me! P.P.S. 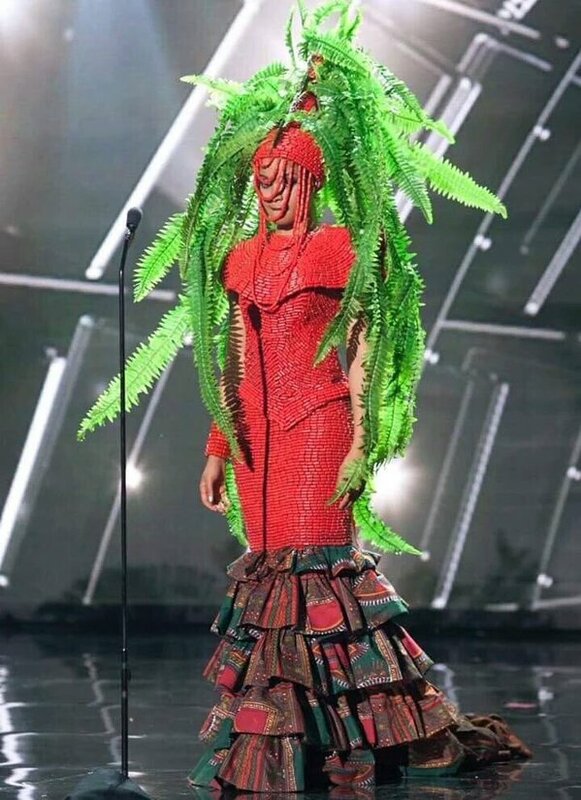 I can do another post about the Nigerian contestant and the importance of seeking advice, but I’m not sure you will like me when I’m done with her, so let me drop my mic and leave this picture with you.